Alpha Brain Instant Review: If you have never heard about nootropic supplements, here is a little insight. Nootropic supplements, also referred to as smart drugs, are memory and cognitive enhancers. They are generally known as “nutraceuticals” and help improve your intelligence. They are supplements that enhance one or more features of mental function. The new Alpha Brain Instant can only be a better version of earlier 750 mg Alpha BRAIN (check out our Alpha Brain Review for more info) formula capsule supplement. The new version of Onnit’s bestselling nootropic formula is a drink mix that is sweetened and has a huge dosage enhancement in one major blend. The modified version of Alpha BRAIN formula that’s made in crystalline drink-mix form is available in very convenient 3.7 g drink mix packaging in peach and spice flavors. An Alpha Brain Instant Review will reveal some essential facts about the supplement. • The supplement is fast acting. It is definitely an upgrade over the Alpha Brain capsule. The liquefied supplement is absorbed much faster and the cognitive benefits are achieved quite rapidly. • The supplement provides consumers with a direct Neurotransmitter effect. What this means is that you become more focused, and your memory and brain processing are accelerated. This is achieved through brain chemicals and there is limited brainwave emphasis when the instant supplement is used. • The supplement has been certified as drug free. This gives it a wonderful mark of quality because it has been tested by a third party and validated as clean by Banned Substances Control Group. The serving size for adults is a packet which is 3.7 g which must be taken with cold water and is better taken with a light meal. Each container has 30 servings. The supplement has about 10 milligrams of Vitamin B-6 and Onnit Flow Blend which contains 1,150 milligrams of L-Tyrosine and L-Theanine. It also contains 1,150 milligrams of oat straw concentrate and Phosphatidylserine. It has about 350 milligrams of AC-11 cat’s claw concentrate and Onnit Focus blends that contain 240 milligrams of Glycerylphosphorylcholine (GPC), Bacopa, and aerial root extracts such as monniera concentrate, and Huperzia serrata concentrates. The Onnit fuel blends have 71 milligrams of L-Leucine and Vinpocetine. It also contains a Bioperine black pepper fruit concentrate and Pterostilbene. It also has soy, natural flavors, and other ingredients. 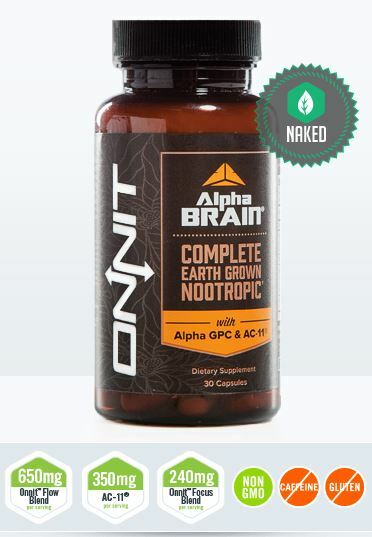 The components found in the new formulation are almost similar to the ones in the original Alpha Brain. A few essential additions however make quite an immense difference and this is why the formulation is quite effective. Two components contain the five major nootropics. There is Phosphatidylserine which works well for memory and L-Theanine which enables you to enjoy wakeful relaxation. Oatstraw has Alpha brainwave advantages that function well with L — Theanine and this helps greatly with calm productivity. The L-Tyrosine is great for neurotransmitters and this provides you with very excellent brain benefits. The major upgrade with new formulation is the Flow Blend. The dosage has been doubled from the original 650 milligrams to 1150 milligrams. The AC -11is a brain nutrient and Bacopa and Huperzia Serrata are wonderful brain health additives. The Fuel Blend helps to improve the absorption of other nutrients. Vinpocetine enhances brain circulation, while Pterostilbeneheps preserve brain cells. The Vitamin B6 is great for neurotransmitters. Alpha Brain Instant review is by far much better than Alpha Brain. The Flow Blend is two times the dose of the original and this is great as a nootropic. Basically, its critical mass dosage functions better. Because of its solvent nature, absorption is enhanced and all the ingredients are optimized because of the inclusion of black paper. 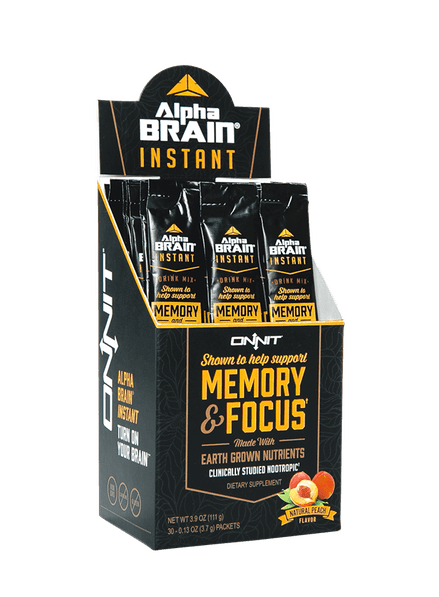 Alpha Brain Instant will boost memory and focus while enhancing processing speed. However, the Flow Blend remains its strongest feature because it enhances creativity and productivity. Another advantage is that the formulation has been clinically proven to have no side effects and is stimulant free.